Rosie and Jessica's Day of Fun – Page 2 – Things we do and make and see. In episode 113, Rosie and Jessica have both melted into small puddles in the heat. Somehow they have still managed to go to the theatre, the allotment, various yarn shops and dress up as Pawnee Goddesses at YALC. Will they have returned to solid form by the next episode? Stay tuned! In episode 112, Rosie and Jessica have been to Norfolk, the theatre and the cinema. Well. Rosie has. Jessica has been on the Central Line. It’s been a sweltering fortnight but Rosie and Jessica are here to cheer you with tales of fox cubs and investigative journalism into young people and board games. Want badges? Head to our new shop! 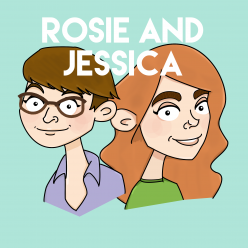 In episode 111, Rosie and Jessica have been building bug hotels, attending weddings and discussing period poverty. Not all at the same time. Then it’s time for an in-depth look back over this season of RuPaul’s Drag Race now that we have a final four and how the true winner of the season went out in episode one. In episode 110, Rosie and Jessica have been “enjoying” the Bank Holiday weather, by which we mean getting lied to by it. Rosie’s been at a boat show, Jessica’s not planted out her tomatoes. It’s time for a seasonal Top 5 with the best foods for your barbecue (that aren’t sausages.) This episode is not sponsored by Squatty Potty. In episode 109, Rosie and Jessica discuss the events of this weekend’s Eurovision Song Contest and the various qualities of different milk alternatives. Allotments are growing and the wisteria is looking lovely. Please remember to always wear sunblock! In episode 108, Rosie and Jessica have seen each other twice this fortnight, for a sleepover and a stage show. Jessica’s been busy at her allotment while Rosie’s been at Wonderwool Wales and is not too tired to talk about it. Plus the haunting image of a man making mouth flapjacks! In episode 106, Rosie and Jessica catch up on some cultural items, a wide range of weather and the Herculean burden of cleaning out flowers. Then there’s a very spoiler-y Late Review of 2015’s revenge-comedy-drama-western The Dressmaker and a whole bunch of articles and videos to check out in What Have We Seen This Week. In episode 105, Rosie and Jessica have been to a little show called HAMILTON. Talking about that takes up most of the episode, to be honest. Then there’s a Late Review of the lovely 2014 movie Pride, some snacks, some songs and some things on the internet.